By now, Barn had fitted his rack – which he hopes will be the first of many if the idea is successful – and then he stood back to examine his handiwork critically, arranging a few spoons to test the effect. 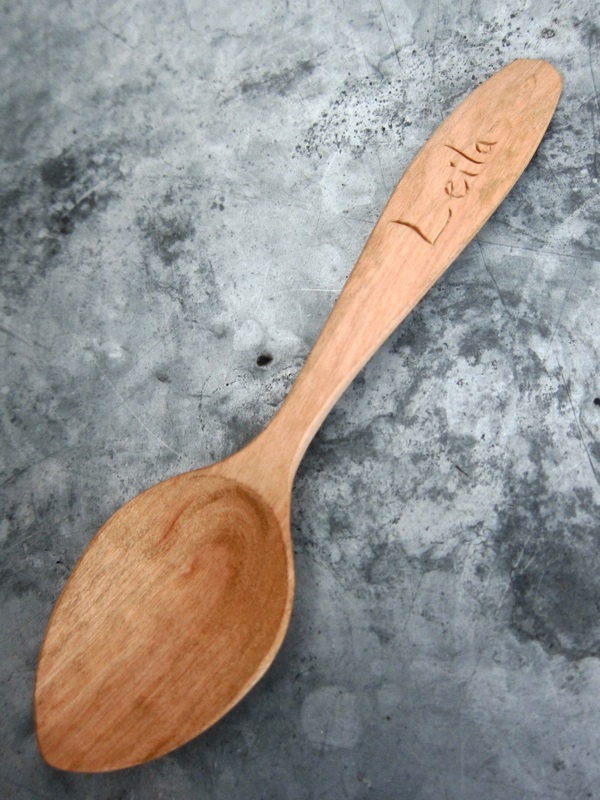 First on the rack was an alder spoon made as a gift for Leila, with her name graven on the handle. “Leila’s spoon is a Scandavian design from a bent branch, so it was very complicated to carve, ” admitted Barn, placing the cherished implement reluctantly in its new home,“It’s so beautiful, I really wanted to keep it.” Beside this, he put a cherry spoon based upon a medieval London spoon at the Museum of London and then a Welsh cawl spoon in sycamore wood to complete the trio. 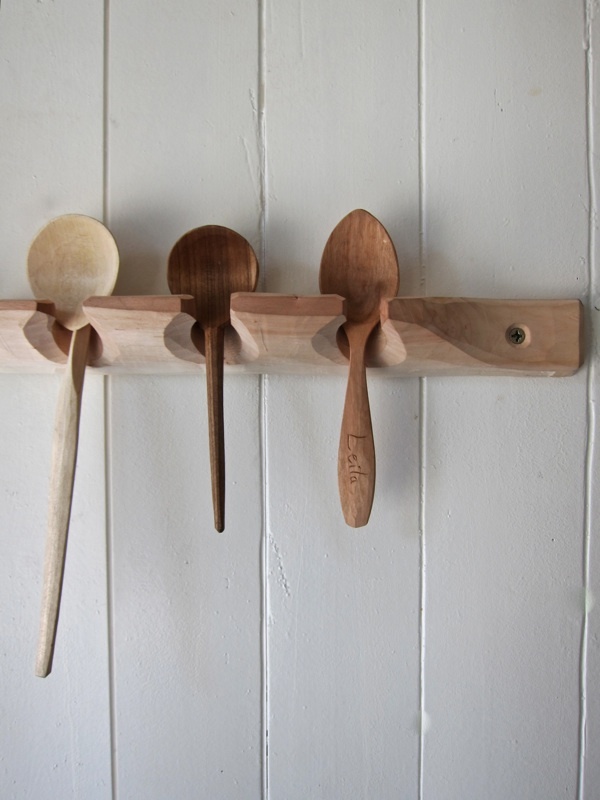 The three of us stood in silence admiring the completed spoon rack. “It looks so at home already,” added Leila with a smile of approval. 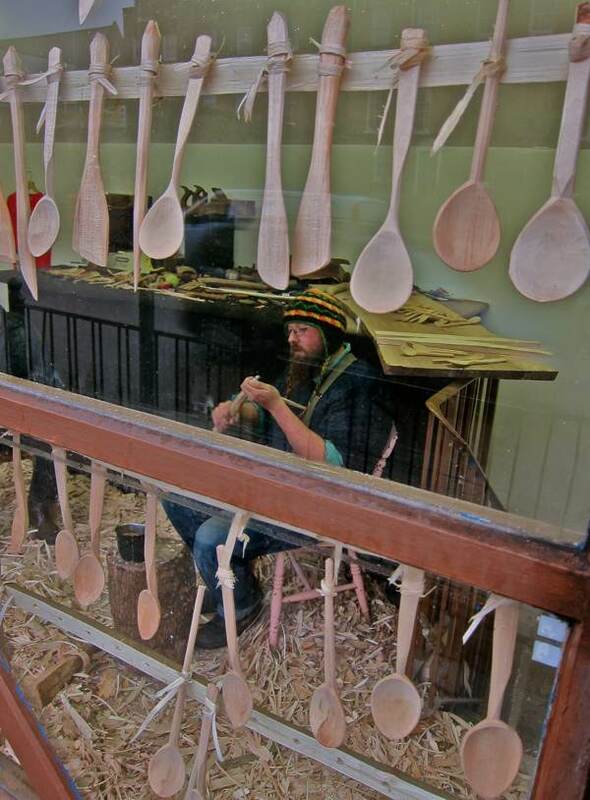 From left, traditional Welsh cawl spoon in sycamore wood, medieval London spoon in cherry wood based upon an example at the Museum of London and Scandanavian style spoon in alder wood. Spoon made for Leila McAlister from a bent branch of alder from Tower Hamlets Cemetery Park. I’m from the UK, but live in Melbourne. I am envious. I wanted a spoon by Barn very much and visited the shop on Saturday 6 July. But Barn was out. And he doesn’t sell online and anyway that would not be the same. Next time. I have enjoyed the blog now for over a year and it inspired us to explore Spitalfields and the environs while we were in London this time. It was strange to feel you know a place, but from reading about it. Don’t stop Gentle Author, your writing is much appreciated for the content and the expression. Lovely, I shall get a spoon. Joy of joys you have helped me find the Paris restaurant I have been trying to find for years. I went there as an art student, with all my fellow art students in the eighties. I’ve been trying to re-find it ever since, but no-one recognised my description of it. Chez Chartier here I come. Dear Sally, I am sure we can arrange to send you one in the mail if you want – just let me know! Utterly lovely piece. 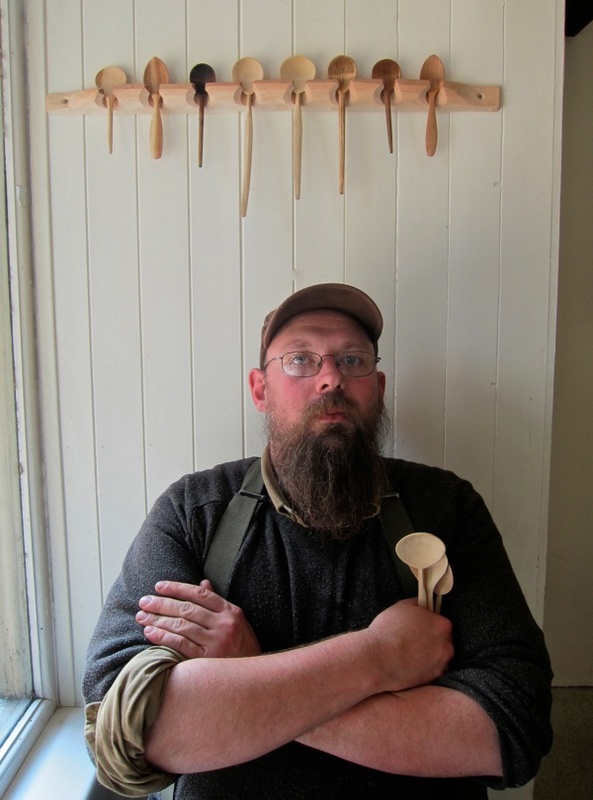 “You’re going to become a different person if you eat with your own handmade spoon…” Great spoons. Great man. Great idea. 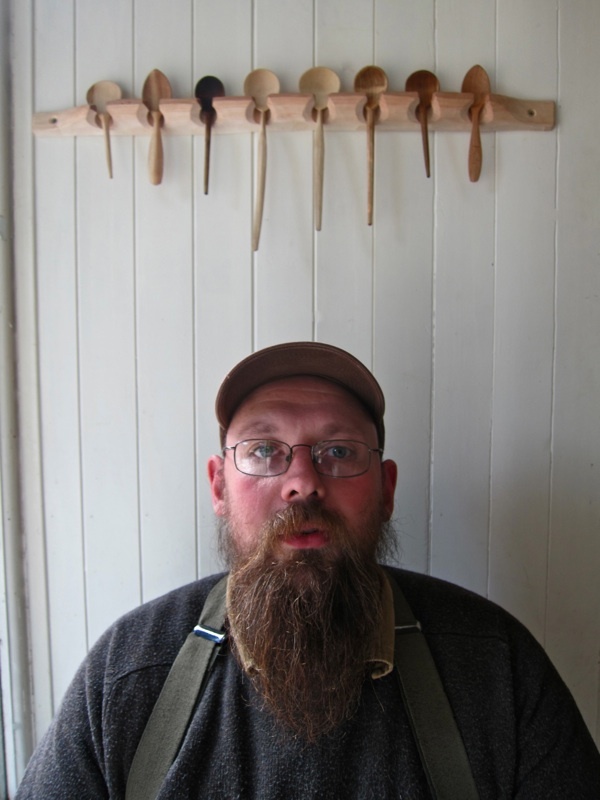 Lovely post on Barn the spoon – but I love your new heading with sheep and houses even more. 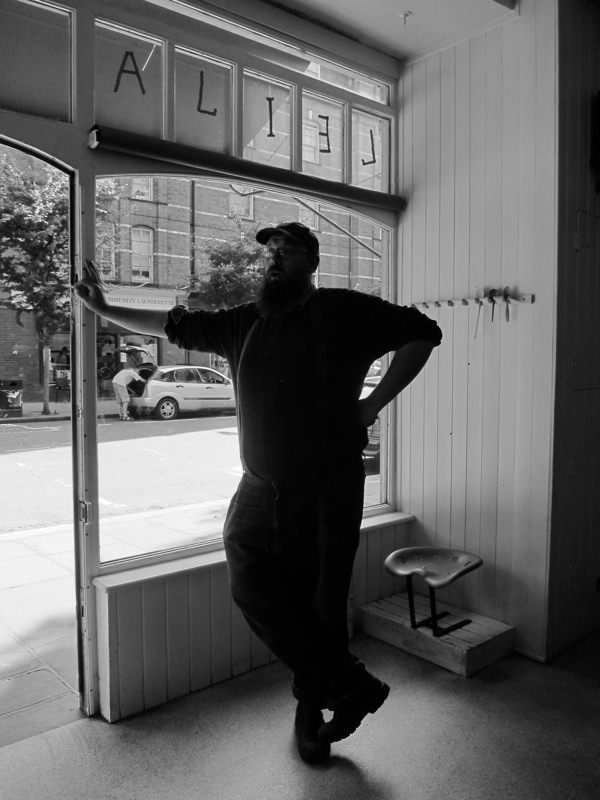 Wonderful to see another post about Barn… I have had the good fortune to meet him on two recent trips to London and the joy of selecting spoons. Agree with Jill – love the new heading -the houses and sheep are a treat! I would like that GA. Should we discuss via email the way one orders such a bespoke item, or items? Are you selling spoons online? I live in Dublin and cannot get to the shop. My wife would love one.